It is in our benefit buing Romanian products. 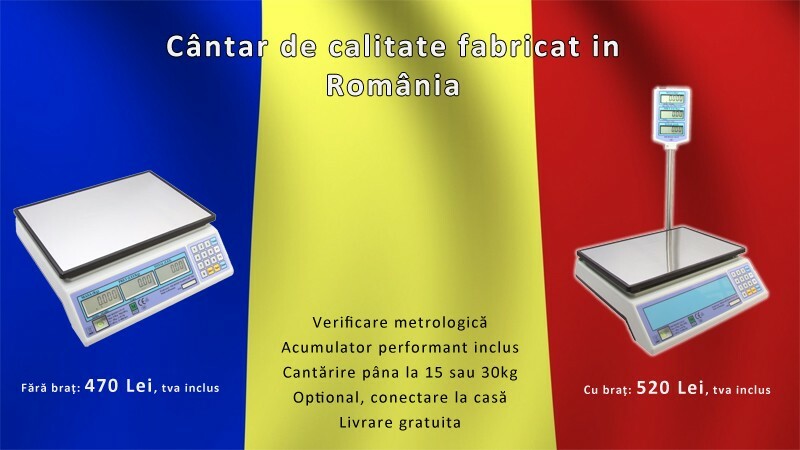 We proudly present a scale manufactured in Romania (by the Romanian company Microsif) that meet all standards of quality. One of the advantages of purchasing this scale is the very accessible price, being below the price of similar scales manufactured in China or Taiwan. - The version with arm - CP - can be purchased at the price of 520 lei, VAT included. The scales can connect now to a cash regiter or PC! The price of the connection interface is 70 Lei, VAT included (cables included). Prices include European certificate of conformity. - Up to 30 kg with 10 grams division. The price include the battery. Delivery is free in any city.